As we follow trends in the production industry, the phrase we keep hearing is this: HD is not enough. The world is quickly turning to 4K as the new high resolution standard. 4K cameras have been around for several years and 4K TV’s are showing up on Amazon for under $1000. We believe that you will be using 4K soon, if you are not already. So, we’ve been busy building a library of thousands of 4K shots since RED released the first 4K digital cinema camera in 2007. 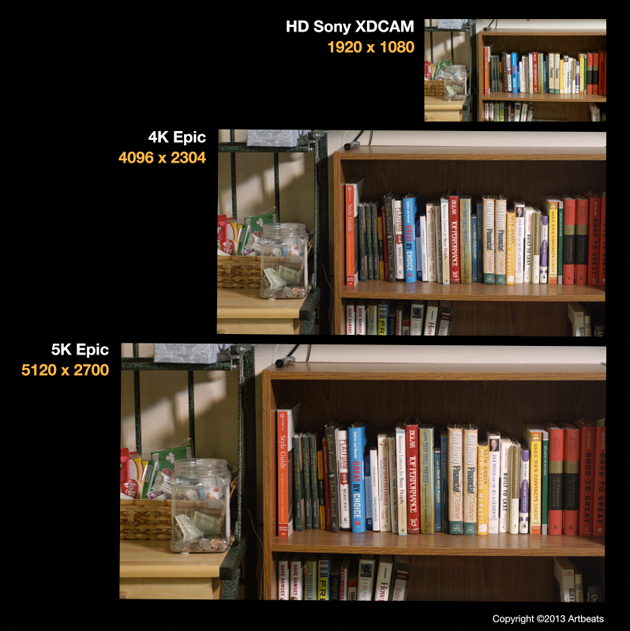 But what really is 4K and how can it impact your work? I’ll answer these questions from Artbeats’ perspective. 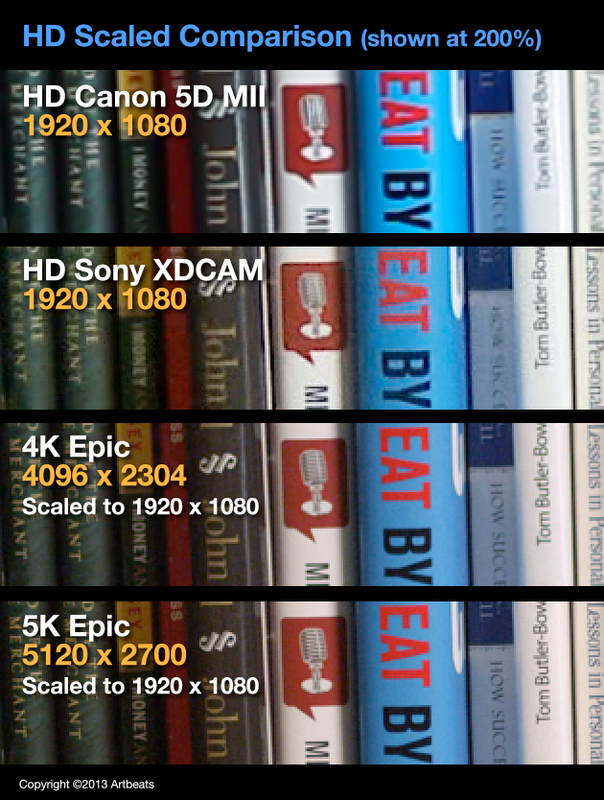 First, how do we define 4K? It is the term used to define an image that is close to 4,000 pixels wide. I say “close” because depending on the camera, monitor, or playing device, 4K size can vary. At a minimum 4K must be 3840 x 2160 pixels which is the most common resolution accepted by TV’s and 4K players. This is also known as Ultra HD, UHD, Quad HD, 4K HD and even just 4K. This chart shows how these resolutions compare to each other and to HD. 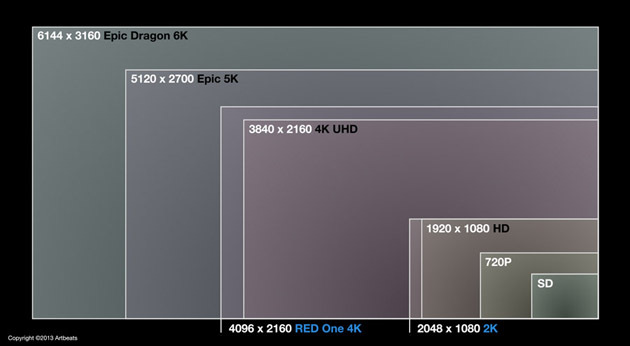 If you commonly work in HD resolutions, you may look at this chart and say that 4K looks like a huge overkill. You simply do not need that many pixels and the hassle of dealing with larger files. However, even if your final project will be distributed as HD, 4K will give you sharper HD images, with better color and deeper dynamic range. To show how this works, we shot a scene with an EPIC and 2 HD cameras, a Sony XDCAM, and a Canon 5D Mark II. The Epic we shot in both 4K and 5K resolutions. We matched the frame exactly when shooting regardless of the resolution. The size comparison of these files matches the resolution chart above. Again, we are showing cropped images here, just a tiny portion of the full image. As you can see, the HD images sourced on 4K and 5K are cleaner, sharper, more true to life. Cameras generally yield images with less detail because of the limitations of the sensor, recording system –which often uses compression–, and lens. The workable resolution, called measured resolution is significantly less than the pixel resolution, typically about 80% less. The pixels are still there, but the absolute highest level of detail the camera can deliver will always be less. So, an HD image of 1920 pixels wide has a measured resolution of around 1530 pixels. 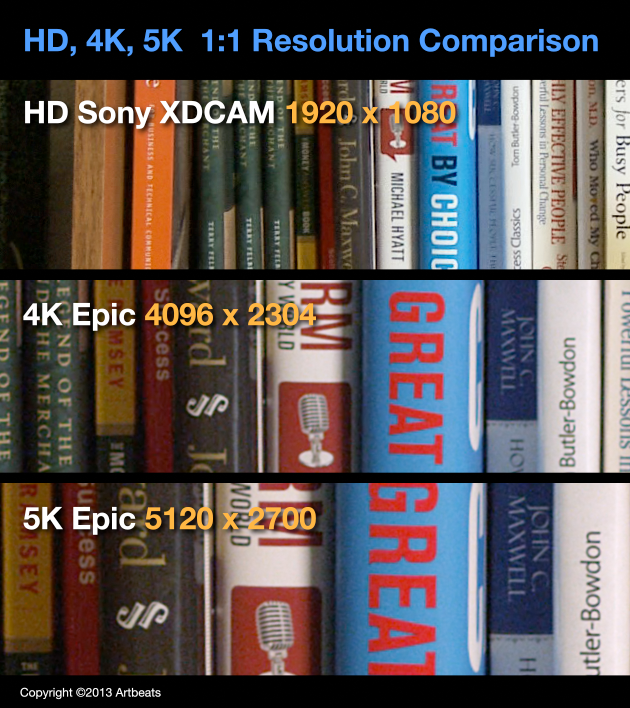 A 4K image has a measured resolution of 3.3K and so on. Eventually, producers will want a 4K measured resolution, which is why Artbeats is shooting footage at 5K resolutions and higher. Why can’t cameras with a resolution of 1920×1080 deliver a true 1920×1080 measured resolution? Due to the pattern of red, green, and blue sensor sites (called a Bayer pattern), the processing that must be done (called Demosaic) will yield less than if each individual site contained all the RGB information. The recording system and the lens will also play a part in how soft the final image is. Cameras typically have detail enhancement or other sharpening algorithms at work to compensate for this softness. This sharpening can cause artifacts like “ringing” which makes high contrast edges look stressed. You can see this effect in the XDCAM example above. The effect is also visible on the word “Eat” with the Canon 5D MII. Granted, this is not a perfectly fair comparison. The Canon 5D MII and XDCAM recording systems are inferior to REDcode in ways that go beyond resolution. For example, some of what you are seeing in the comparison are compression artifacts. Regardless, the principle still applies, that a scaled 4K image will still be superior to a 1920 x 1080 capture, even if it is shot on a high-end HD camera. Other benefits of 4K to HD scaling include better color and dynamic range, (which means that the image has a lower noise floor). How does this work? The process is called over-sampling. If you think of scaling an image to fifty percent of its size, then we are averaging every 4 pixels into every 1. That’s 4 times the information in each pixel vs. each pixel generated by an HD camera! Scaling down always yields a similar benefit, especially if you are scaling to 80% or less. As you can see, starting your production workflow with 4K sources has merit. However, if you are shopping for footage at Artbeats, do you always have to purchase 4K footage to get the benefit of over-sampling? Not in every case. If the footage was shot on a 4K camera, the HD footage will have been scaled from 4K, yielding a much cleaner image than that shot with an HD camera. How do you know if the shot you are interested in was sourced in 4K resolution? 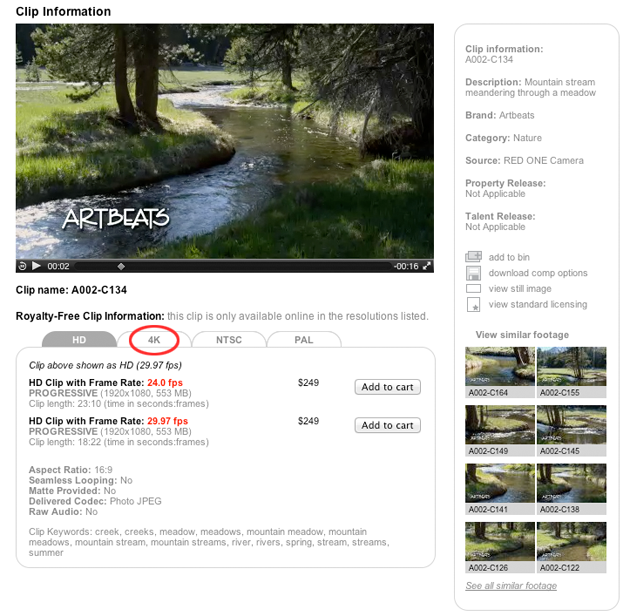 Each clip has an information page that shows a series of tabs in the middle. 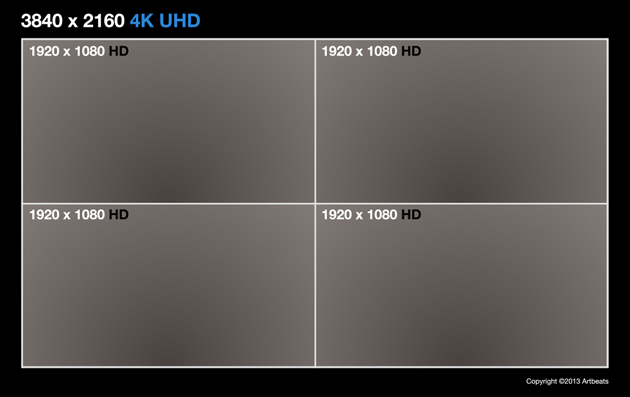 If you see a 4K tab, then you know that the HD was scaled down, giving you the benefit of 4K over-sampling. Even a 3K tab will give you a similar benefit to the HD footage. Our 4K footage spans a wide range of subjects from nature to lifestyles to aerials. We’ve prepared a demo to give you a taste of the diversity within our 4K library. Just click here to view. In Part 2, I will continue to share how 4K footage impacts production and the stock footage world.